Were 69 C.E. known as the Year of the Three Emperors, maybe the long and glorious era of the porcine Vitellius would still be celebrated today. Unfortunately for Vitellius, 69 was the Year of the Four Emperors … and our Emperor No. 3 had his brief reign brutally aborted at the Gemonian Stairs on December 22. Vitellius came from a political family; his father as Governor of Syria deposed Christ‘s reluctant judge Pontius Pilate. In time, Vitellius’s own ruin would emerge from the Levant. But first he had a run down Roman elites’ cursus honorum of Roman offices; he served as Consul in the year 48. 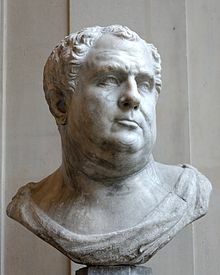 Even so, he’s described to us as a ridiculous character, so much so that Vitellius himself supposedly mocked astrologers over the self-evidently preposterous prediction that he of all people could become emperor. According to these chroniclers, the dissipated Vitellius entered history by the side door. 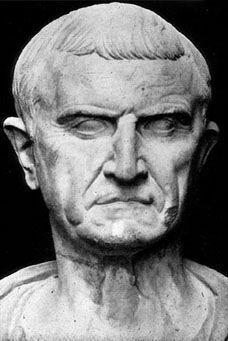 The first emperor of our august year was Galba, who overthrew Nero late in 68. Galba appointed Vitellius to command the restive Rhine legions, who had notably put down the revolt of one of Galba’s early supporters and were now getting short shrift from the Galba administration. The plan here is a little sketchy; Suetonius says it was “rather through contempt than favour,” perhaps that this no-account fop would deprive the Germanic forces of an adequate figurehead for revolt. Vitellius’s dismayed creditors could scarcely be prevailed upon to let him leave Rome. Now, Suetonius and Cassius Dio are extremely hostile witnesses who wrote (respectively) during the Flavian dynasty that Vitellius’s own usurper established, and in the wake of that period. * The facts on the ground are that Vitellius had been Consul as well as a provincial governor, was appointed by Galba to manage the vital German frontier, and leveraged the position into mastery (however brief) of the Roman world. Even these historians give Vitellius grudging credit for some of his wise civic reforms once he took power. And at the end, when all was hopeless, Vitellius’s loyalists furiously resisted their foes in the streets of Rome herself, fighting “in a solid mass opposed the victors and to a man fell giving blow for blow, dying with faces to the foe” (Tacitus, who wrote after the Flavians had passed, but whose family was elevated during that dynasty). Read without interlocutors’ gleeful character assassination, we might better incline to perceive not a buffoon but a capable political leader whom fortune (and a very large army) contrived to crush at the moment of his glory. Be that as it may, the Caput Mundi was to find in the generations ahead that men of mediocre stature could readily be wrapped in purple by a willing army. More often than not it proved a purple shroud — as it did with Vitellius. These Rhine legions had their grievances and whether Vitellius was a great man or small, he was emperor material enough for them. On New Year’s Day of 69, when they were supposed to take an oath to the sitting emperor, they instead cast down images of the much-resented Galba and acclaimed their new governor in his place. But even as the rebellious legions strapped on their greaves, Galba was being overthrown and executed within the walls of Rome itself. Otho’s scruples were not shared by all, including devoted supporters who could hardly fail to be moved by the sacrificial gesture. Most of these declared with the eastern provinces for the general Vespasian, lately engaged in smashing the Jewish revolt in Judea. Vespasian was destined to be the ultimate winner in the Year of the Four Emperors — the man who could claim power, and hold it, and pass it on to his heirs. With the East came Egypt’s grain supplies, upon which Rome depended. He moved methodically but by October 69 one of his generals was penetrating Italy. By coincidence, the forces of the rival emperors again met at a second Battle of Bedriacum. Once again, it was won by the upstart. they bound his hands behind his back and put a rope round his neck. And thus they led down from the palace the Caesar who had revelled there; along the Sacred Way they dragged the emperor who had often paraded past in his chair of state, and they conducted the Augustus to the Forum, where he had often addressed the people. Some buffeted him, some plucked at his beard; all mocked him, all insulted him, making comments especially upon his riotous living, since he had a protuberant belly. When, in shame at this treatment, he lowered his gaze, the soldiers would prick him under the chin with their daggers, in order to make him look up even against his will. A German who witnessed this could not endure it, but taking pity on him cried: “I will help you in the only way that I can.” Thereupon he wounded Vitellius and slew himself. Now, Vitellius did not die of the wound, but was dragged to the prison, as were also his statues, while many jests and many opprobrious remarks were made about them. Finally, grieved to the heart at what he had suffered and what he had been hearing, he cried: “And yet I was once your emperor.” At that the soldiers became enraged and led him to the Stairway, where they struck him down. Then they cut off his head and carried it about all over the city. * Suetonius was also directly self-interested: his father fought for Otho, and against Vitellius, at Bedriacum.